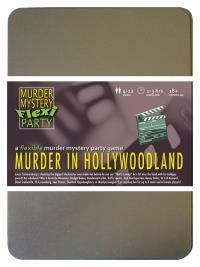 You've been invited to play the role of ARNIE DE NIRONATOR in Murder in Hollywoodland. You're invited to a star-studded yacht party, as Lucas Cameronburg is shooting the biggest blockbuster ever made! But before he can say "That's a wrap! ", he's hit over the head with his Goldguy award and pushed overboard! Join us to find out who cut Cameronburg from his own film! Black tuxedo, white shirt, slicked back hair and a black bow-tie - that’s just standard daywear in your Family. The black leather biker jacket and cool shades, however, are your own personal touch. You always carry a concealed firearm (or two). You come from a mob family. It was your father’s idea for you to become an actor. He wanted someone on the inside of Hollywood, to help broker his “investments” and make sure everyone knew who was really in charge. As you are known more for your muscle than your brainpower, you have been very effective in that role. The trouble is, you actually started to like acting and have decided you want to make a career out of it. My name is Arnie DeNironator. I am an actor. I played a robot in ROBOTS FROM THE FUTURE and ROBOTS FROM THE FUTURE 2: RETURN OF THE ROBOTS. In Cameronburg’s new film, I’m playing a cyborg from a parallel universe. It’s a challenging new direction for me. When I’m not acting I help run my Sicilian family’s business, with my father and brothers. If anyone finds a cheque for a billion dollars it’s mine. Seriously.